A seaside vacation is a favorite way to recharge for most people; something about the sun, the sand, and that hypnotic roll of the ocean just seems to soothe the soul. Even if your home base is landlocked, it doesn't mean you have to leave that laid back feeling of respite at the shore. Incorporating beach themes into your bedroom is a great way to make sure you get a taste of that stress-free beach vacation feeling every single night. 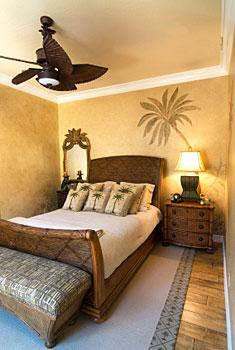 Color often makes or breaks a room, and beach theme bedrooms are no different. There are a few different ways to use color in a beach themed bedroom. If you want to have a nautical theme, then think of red, white and blues. If you want to go with a more tropical feel, you have your choice of going with bright colors, pastels, or some combination of the two. Whether you go down the nautical road or the tropical road is a matter of personal preference - along the lines of whether your ideal beach vacation is more Cape Cod or Caribbean islands. The best furniture for your new beach bedroom should incorporate natural elements from seaside environments. Look for polished driftwood, teak, bamboo and wicker accessories that inspire that beachy feeling. Lighter shades of wood work best for beach themed decorating, although darker pieces can be incorporated into nautical themes. Stick to your color palette when choosing bedding in your beach themed design. 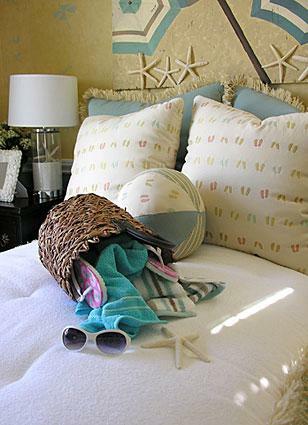 Look for soft blue, tan or coral colored duvet covers and quilts that incorporate shell, palm tree and anchor designs. If a print isn't for you, look for two-toned quilts and covers in shades of blue or gray that will provide a soft focal point and background for more colorful throw pillows or design accents. Give your bedroom some privacy with a natural fiber shade. The color and textures available in fiber shades help to create the appearance of netting, which is perfect for a beach theme. Look for gauzy curtains to complete the look in shades of white, pale blue, gray or yellow. To add a touch of color and interest, stencil shells, anchors or coral pieces down one side of each panel. The hint of extra color will help pull together the space without dominating it. After you have chosen your colors and picked your furniture, of course you need all of the right accessories to pull the look together. This is where you can really start to have some fun with your beach themed bedroom design. Seashells, anchors, hand carved ocean animals, and colorful tropical prints for your walls are all things that will give your room those finishing beach inspired touches. Remember to bring back souvenirs and knick-knacks from your favorite beach getaways to really give your room the feel of your favorite ocean side escape. The final result of your new bedroom design should be a place that you can get away to, to relax. Build your design slowly, piece by piece until you get it exactly right. Each component should be soothing in its own right, to ensure that the overall design is just what you wanted.